Vanceburg City Council Member Glen Bannister asks a question during a regular session of council on Monday. Vanceburg City Council adopted two ordinances to annex property west of the existing city limits and amended a third ordinance to exclude two of the properties in the vicinity of Lions Lane that were originally included in the proposal. The moves came during a brief regular session Monday with a short agenda and standing-room only gathering of interested citizens. 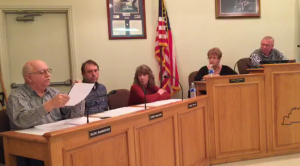 The ordinances were introduced by Council Member Kathy McCann during the January meeting. The Lewis County Board of Education and Lewis County Fiscal Court had officially voiced their opposition to the proposed annexation for their respective properties. The amended proposed ordinance, which received a first reading on Monday, had originally included several properties along Lions Lane including the county and state highway garages.